The Pointe Simon pier is now the most used dock in the center of town. Some ships dock at Tourelles, about 1.5 miles away, a 20 minute walk. Taxi 8 Euro, set price. Hostesses in Creole costumes greet guests with a beaming smile and handing out practical tourist information leaflets and maps. Local musicians welcome visitors with lively Caribbean tunes. The cruise village features a wide variety of vendors, who all accept U.S. dollars, including local clothing stands, jewelry and accessory designers, locally-produced skin care products and perfumes, souvenir shops, local artists exhibiting their paintings and artisanal treats. Set to the rhythm of live music, the experience is enriched by local dancing and rum tasting. Walking from the cruise terminal of Fort de France is very safe and takes about 15 minutes to the downtown area. Just follow the blue line. 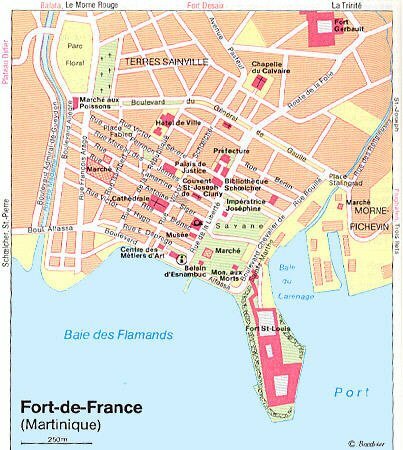 Fort-de-France is a cross between New Orleans and a town on the French Riviera. Narrow streets amble up the evergreen hills that surround this bayside town. There are many English speaking taxi drivers and tour guides on the pier offering services. One suggestion if you want English is to chat a bit with the guide before accepting the offer. Some are good at the first few sentences but have then exhausted their language skills. $50 per hour. There are 3 ferry companies, Madinina, Matinik, and Petrolettes, and the ferry dock is just to the right of the ship (when facing inland), you can see it from the deck of the ship. You can take Matinik to Trois Islets, 5 euros return, a pretty village, no other attractions. The other 2 ferries go to Pointe de Bout, 6.50 euros return (they don’t take dollars), which has some shopping, hotels, marina, and a beach. The Diamant beach is much better, down the coast a few miles by cab. The ferries run frequently, every 30-45 minutes. There is sometimes a ferry dispatcher on the ferry dock to help find the right one, and he speaks some English. Renting a car is not recommended, as traffic is hectic. For a St. Tropez ambiance, take the ferry from the waterfront to Pointe du Bout (20 minutes each way), which has some good beaches -- Anse-Mitan and Anse-a-l'Ane -- and is home to some of the island's major resorts, such as the Kalenda Trois Ilets and the Bakoua. Located only seven miles from Fort-de-France, and very much appreciated by nature-lovers, the Balata Gardens of Martinique now offer an incredible innovating experience to its visitors by allowing them to explore its luxuriant canopy while comfortably strolling on fifteen-meter-high wooden bridges running over the tops of one-hundred-year-old trees and giving a magical breathtaking aerial view of the garden, the bay of Fort-de-France and the Carbet Pitons. The Balata Gardens are a real masterpiece and an internationally-renowned reference for the richness of its botanical collections.. There is excellent duty-free shopping right at the cruise terminal itself. There is also an excellent crafts market near the harbor on the north side of the park that sells everything under the sun. It is well worth a visit if you are looking for local crafts, art, and clothing. Martinique rum is justly renowned and tours of distilleries are available. Martinique is a dependent territory of France and uses the euro as currency. US dollars are not accepted in shops, but many restaurants and hotels take credit cards. The best exchange rates can be had at banks or ATM's. If they will accept USD, the conversion rate will be poor. French and Creole patois are spoken on the islands; English is known by some inhabitants.